Pat chicken wings dry and place in a large bowl. In a small bowl mix paprika, garlic powder, chipotle chili powder, and ground cinnamon. Sprinkle seasoning mixture over chicken wings and then add canola oil, toss to coat all the wings. Add a wire rack to a baking sheet and evenly spread chicken wings out on wire rack. Remove pan from oven, flip the chicken wings and bake for an additional 20-25 minutes. In the meantime, heat a small pot to medium high heat. Add in buffalo sauce and coconut oil, stir until coconut oil is melted and sauce is warm, approximately 5-7 minutes. 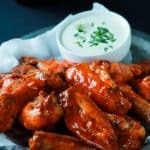 Add cooked chicken wings to a large bowl with the buffalo sauce, toss the chicken wings around with the sauce until all the wings are covered.